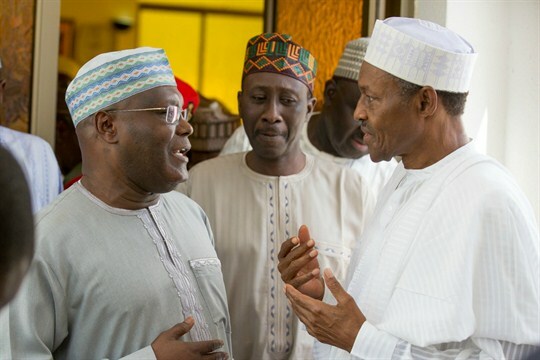 Nigerian President Muhammadu Buhari, right, former Vice President Atiku Abubakar, left, and Babagana Monguno, center, attend Friday prayers, Abuja, Nigeria, Nov. 6, 2015 (SIPA photo via AP Images). He is often tagged as an aloof, slow-moving executive with a narrow and insular coterie of advisers, and he has fallen short of the promises that won him the presidency four years ago. Yet Muhammadu Buhari remains the front-runner in Nigeria’s presidential elections scheduled for Feb. 16, which will pit the incumbent against several challengers—the most prominent, by far, being former Vice President Atiku Abubakar, who served in office from 1999 to 2007 and placed third in the 2007 election. Buhari is still the favorite because of his party’s continued strength in its strongholds in northern and southwestern Nigeria, along with the considerable advantages of incumbency and some specific liabilities of Abubakar.